San Diego is crisscrossed with wild and coyote-filled canyons. A few of these canyons divide streets and neighborhoods and so early city planners built bridges and even staircases here and there to bring the parts – and hopefully the people – together. 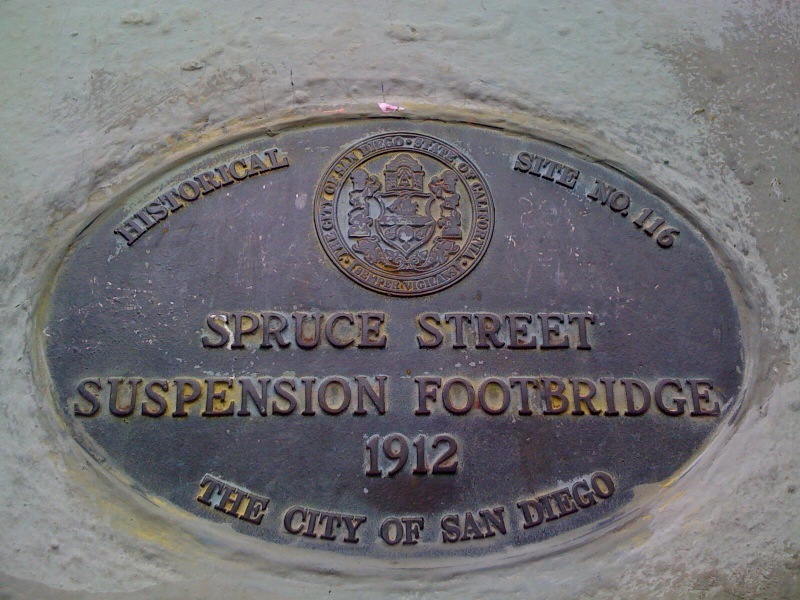 In the Banker’s Hill area, just north of downtown San Diego, a suspension bridge was built in 1912 near First Avenue over Kate Sessions Canyon to connect two parts of Spruce Street. It is one of the city’s hidden gems. Many locals don’t know about it, but those who do call it the Wiggly Bridge because it wiggles and wobbles as you walk across it. It also creaks and clanks and moans. I first crossed Spruce Street suspension bridge 30 years ago on my lunch hour. It’s located in an older, elegant neighborhood, filled with graceful Victorian and Spanish homes, one of which housed the ad agency where I worked. In the mornings, I would park two or three blocks away and walk to work, passing two large houses full of Hari Krishna people outside gardening or inside chanting. One day the owner of the agency said he wanted to show me something. While he said he liked my copywriting, he didn’t seem to like me. We often argued. He was happily married and I wasn’t attracted to him, so I don’t think our personality conflict was romantic. Anyway, there we were one fine Spring day on the wiggly bridge! Laughing, enjoying the view over the canyon and downtown and the ability to get to the other side in a sort of secret way. I thanked him. I think it was his way of saying, “We can work together.” And we did, for two more good years. 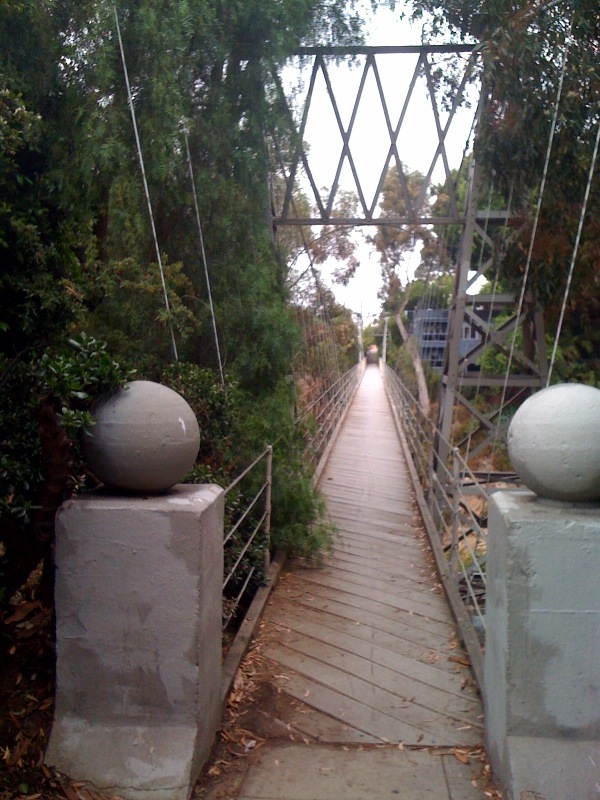 Recently I watched a show on local TV about the Spruce Street bridge (“About San Diego” with Ken Kramer). There it was in all its creaking glory, “another story about San Diego,” as Mr. Kramer likes to say. This inspired me to drive down and take photos and another wobbly walk. But in some ways I was already on it. 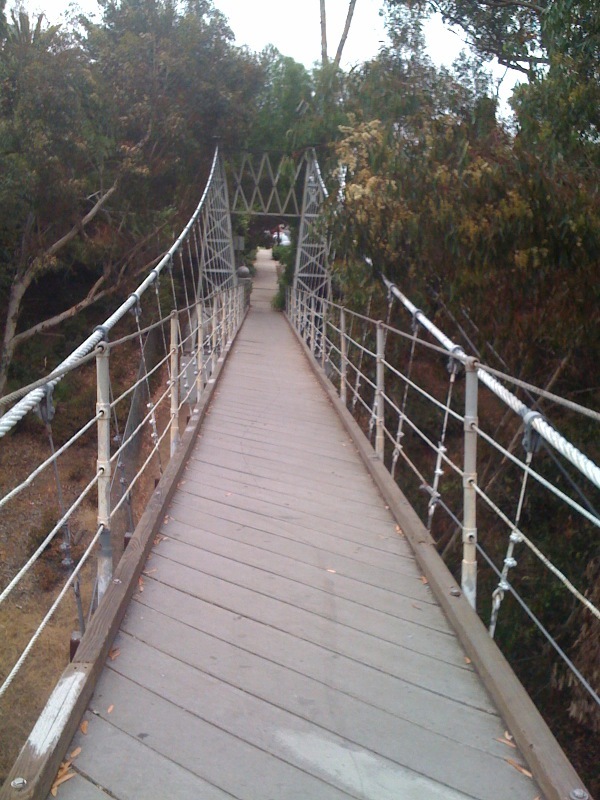 In the middle of moving, I am on my own bridge – suspended, swaying in the air, between one home and another. Betwixt and Between, that’s me. Not to be confused with Bewitched, Bothered and Bewildered, that state of temporary insanity hardwired into us so we’ll mate and procreate, which I’d actually prefer right now, except I wouldn’t get my packing finished. No, I mean the feeling of being neither here nor there, not belonging anywhere. My home of eight years is devoid of life now (except for my suspicious cats) and full of boxes. My new home is having its innards ripped out and is not yet ready to live in. I had planned to leave my current home in a couple of years, to downsize, but a sale and large rent increase put my plans on fast forward and my feet back out onto the streets. Old and new streets. Former neighborhoods. Would I like to be back there again? Exploring new areas. Maybe I should try living over a store or ??? By luck (and talking to neighbors), I found a new place right around the corner. If it weren’t for a tall condo a few doors down, I could see it from my current window. Straight as the seagulls fly. I don’t know if I will like it. I’ve loved my current space, full of light and looking out over trees and people. I leave it reluctantly, yet I also feel ready to make a new home. So here I am, walking the wiggly walk, swaying in the salt air breeze, listening to the coyotes, holding on, no desire to jump, suspended between two parts of the same neighborhood, curious about the other side.